The Lord of the Seas rides regally atop the waves in his chariot, drawn by the foaming wavecrests in the form of horses. Poseidon was one of the eldest of the twelve Olympian deities and was said to have a fondness for horses, in some myths being regarded as their father. 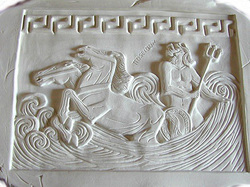 He was a particularly important god to the ancient Greeks, who relied heavily on sea travel. 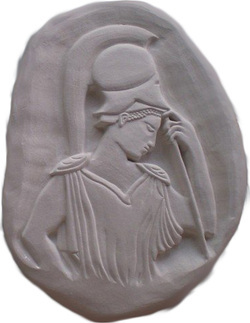 The original ancient carving is commonly known as 'Mourning Athena', but I prefer to think the goddess is simply resting from battle, contemplating the war before her. It is dated to 460 BC and was found within the Acropolis of Athens. It is an evocatively calm pose for a goddess who was so closely tied with action. Athena was both the protector of her patron city as well as the goddess of all heroic deeds, and as such is often shown girded for war. 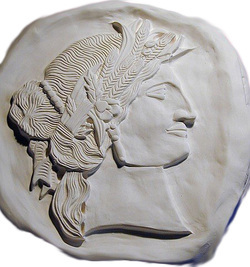 Demeter, mother of Persephone who was taken to Hades, was venerated as the goddess of fertility and harvest. She is often shown with stalks of wheat, flowers or berries woven within her hair to emphasise her close associations with the earth and living things. She and her daughter were intrinsically tied to cycles, with Persephone's descent into Hades representing both the cycle of life and death as well as the lesser cycle of seasons.